Gone With The Fashion: Hanging On To Winter.. I have to be honest - I am a winter baby and thus, a winter dresser. I have ridiculously pale skin, it takes on a bluish hue at times, and there is no way I could maintain enough dedication to fake tan to make a healthier shade look convincing. I long to have a festival inspired look - all tousled hair and sun kissed skin all mixed in with an air of Bridget Bardot nonchalance... but sadly I'm far too straight laced. Summer came and went recently in London, loitering for but a week or two. I found myself peering out at the sunny day- anxiously, hesitantly, leaving behind my coat, and stepping outside surrounded by an air of worry on my way to work. Was it really time to let go of my now trusty leoaprd print coat?? Was I being just a little bit mad?! As it happens, no. It went bitterly cold again a few days later and my faux friend was back out for a trip to the Junction for brunch, teamed with my wool APC jumper, Topshop jeans and Converses. I could barely contain my excitement. 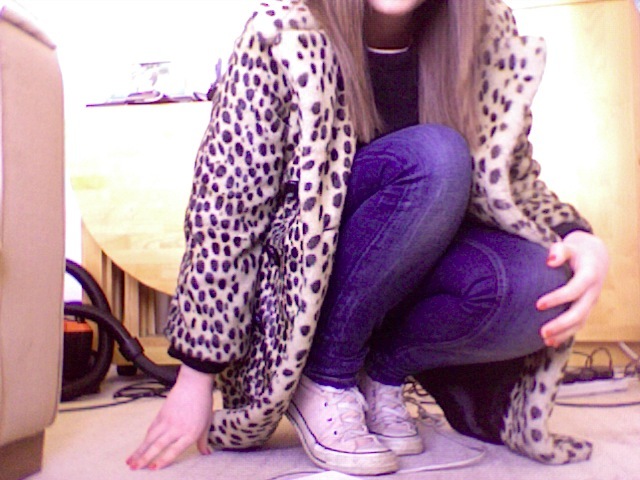 I find the layers of winter just a lot easier - the coats, the jumpers the shearling lined shoes!! I'm already longing for next winter and all the Burberry-esque aviator jackets that are sure to catch my eye. Bad news is the sun seems to be back. (I know it's good news really, it just means I have to get planning my summer wardrobe fast, ready for the big reveal!) The little Mulberry from my last post is still a big contender, mixed with lovely crisp white cotton blouses (Zara? ), Reiss's lovely new sunglasses, denim shorts, Topshop kimono jackets and breton stripes. Quite possibly even a statement scarf to replace the statement coat too? Hmm... Erdem florals would do quite nicely.